Those are some big melons…..
Melons! Big melons! Beautiful melons! Everywhere I look, melons! Ok, people. Minds out of the gutter, please. My farmer had melons today. Delicious melons. Red watermelon, yellow watermelon, cantaloupe…. My favorites. I decided to try the yellow first. A small melon, easy to wash. As I tipped the knife into the green, striped flesh, the melon made a satisfying cracking sound as it popped open like a friendly trap. The melon’s voice was the combination of a snap, ripping paper, and the sound it makes when you bite into an apple. An auditory and visual treat that tasted even better! The rest of the box looks delicious, as well. 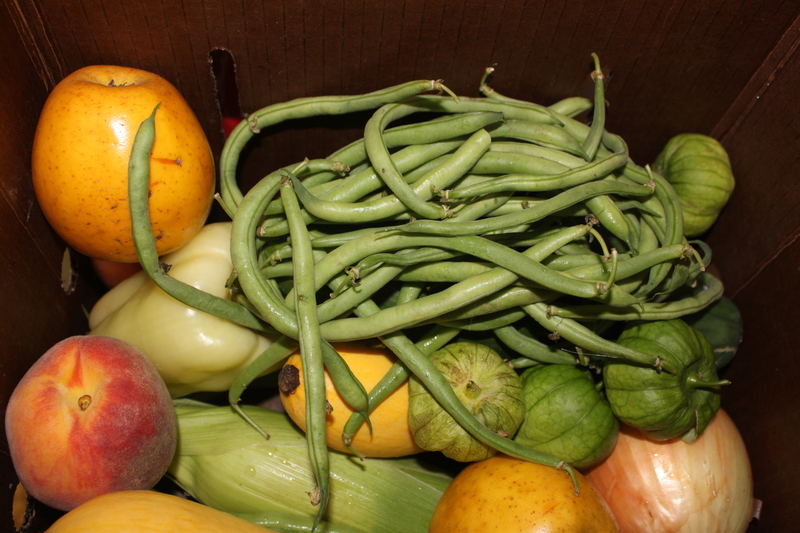 We’ve been getting similar items each week, but this week included green beans for the first time. Also corn, tomatillos, cucumber, squash, apples, and peaches. Looking forward to making some salsa verde with the tomatillos and perhaps a corn and black bean salsa! This entry was posted in CSA, Fruit, Murray Hill Farm and tagged melon on July 28, 2012 by Elyse. Yum! the watermelon looks so good! does yellow taste the same as red? Both your ideas for salsas sound fabulous, Elyse! Good thinkin’! Yellow has the same texture but the taste is slightly different. I’ve actually never thought about the actual taste of watermelon, I just know I love it!! I ate the whole red one today. The yellow is slightly sweeter. 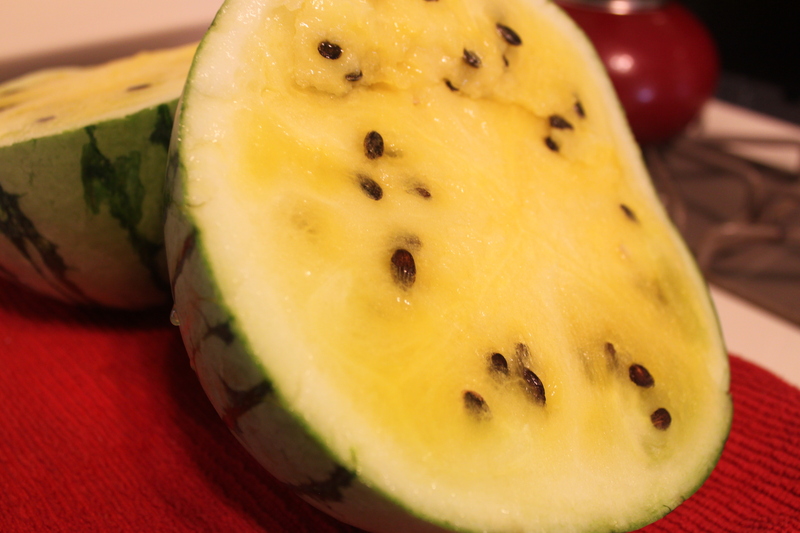 I only just had that yellow watermelon for the first time and I loved it. I love watermelon too! But, I have never had the yellow. Wonder if they sell that at Krieger’s? Or someplace like that. Your ideas sound yummy! That’s a nice looking melon 🙂 Come and show off your melon at this week’s CSA Link party…http://inherchucks.com/2012/07/25/whats-in-the-box-36/. Looking forward to seeing you there!